With a Stamp and a Song: You've Been On My Mind! You've Been On My Mind! We just got back from a trip to Upper Michigan, and although it was hotter than normal for there this time of year, it still wasn't quite as blazing hot as Florida! The nights were cool, even chilly, and Fall felt just around the corner. 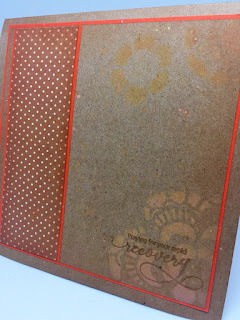 It made me yearn for warm yellows and oranges so I reached for some distress oxides, a stencil and some cinnamon colored polkadot designer paper for today's Stamp Simply project, which will be hand-delivered to a friend who was recently hospitalized. I layered several colors of distress oxide inks onto some white card stock for the focal panel background, splashing drops of water, blotting with a paper towel, then stenciling on some lacy flowers with the brighter colors. Next I diluted some metallic inks with water and splashed them on with a paintbrush. The edges were sponged with regular tea-dye distress ink. 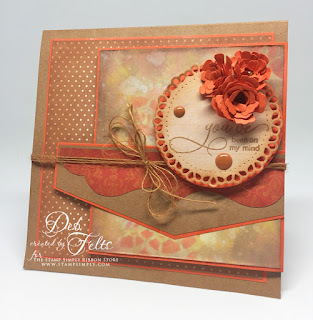 The sentiment panel was cut with the teardrop die from another print from the designer paper, then backed with a classic circle to allow the brighter color to peek from underneath. A cluster of bitty blossoms with sparkly centers add a pop of color to match the horizontal scalloped border which is a punch-out from the same designer paper pad. 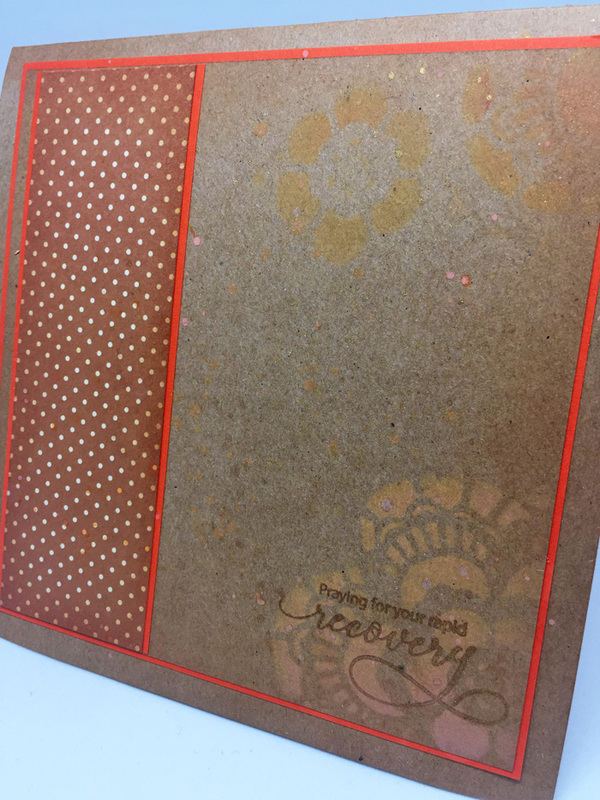 For the inside I repeated the polkadots and a little bit of stenciling on kraft-colored card stock for a more subtle, easier to write on background, adding more splashes of gold and the distress oxide orange. 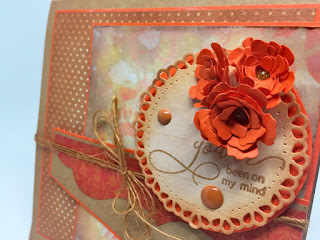 The sentiments outside and in were stamped using the Tim Holtz platform and shimmery Delicata copper ink, in keeping with the relatively monochromatic color scheme. A Pinwheel Card, Just for You!